Back when I could eat gluten I practically lived off vegetable thins, wheat thins and slices of cheese. I really, really missed those when I had to stop eating gluten. 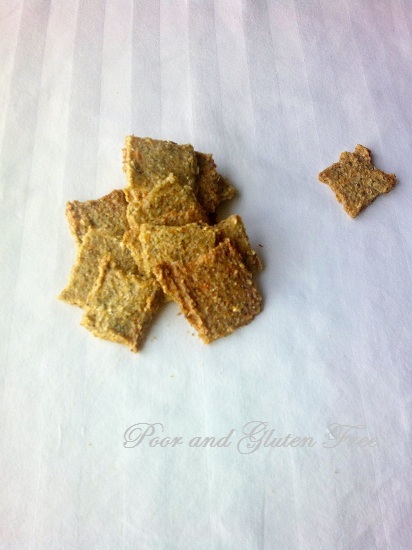 While I’ve tried a variety of pretty decent pre-packaged gluten free crackers, the primary ingredient is usually rice flour, and the savoury flavour of my old glutinous staple seemed lacking. Not long ago, I found myself reading the ingredients on the back of a box of vegetable thins, wondering if I couldn’t recreate them using red peppers, tomatoes, celery, carrots, etc. 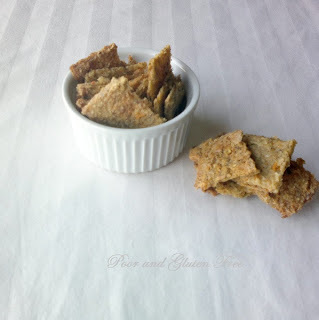 Although I have my flax seed crackers as a quick staple cracker, and they are certainly tasty, they don’t have vegetables in them, and they didn’t provide any basis for creating the type of cracker I was envisioning. 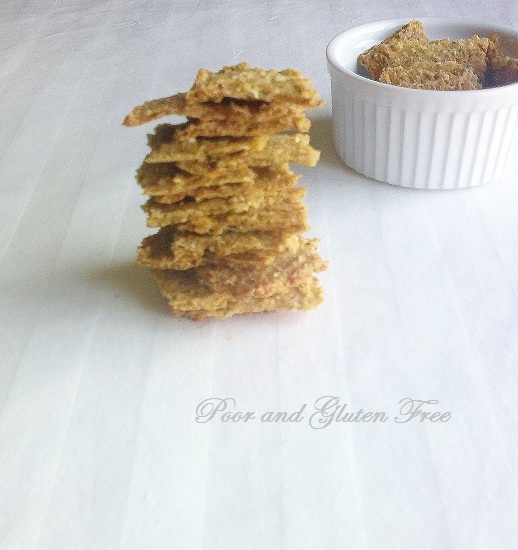 So I searched around and found this recipe for brown rice “Snackers and Breese” on Meghan Telpner’s blog, Making Love in the Kitchen. While my crackers have ended up quite different, her version provided the basis for me to experiment! 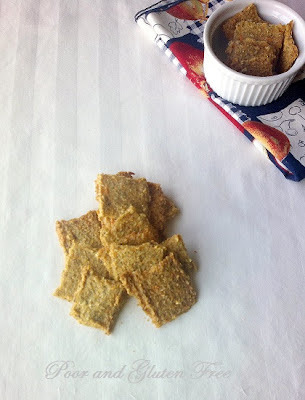 I seriously love these crackers now, and make them in huge batches and store them in glass jars. They're also pretty filling, they're like a small meal. And with all the veggies and brown rice and lentils, I think it’s pretty safe to say that you can eat these guilt free. Depending on what I have in the fridge, the recipe alters a bit, sometimes I use zucchini, red or green peppers, or any other veggies that I find. This makes quite a lot of gluten free vegetable crackers so for your first time you may want to half the recipe. Otherwise, I use 4 baking sheets for these; 2 rectangular cookie sheets, and 2 pizza pans, because that’s what I have. In a large pot, add lentils and brown rice. Add cool water and swish around (water will be cloudy), drain the water using your hand to block the rice and lentils from draining out. Repeat 3-4 times until the water runs clear. Add the 2 ¼ c water and butter to the rice and lentils. Bring to a boil over high heat, then reduce to medium heat, cover and let simmer for 30 minutes until the rice is soft. Heat oven to 350F. Prepare baking sheets by spraying with oil, then cover with parchment paper. In a food processor, blend rice and lentils and everything else together until it is a sticky mass. Using a wet spatula, divide the mush onto the baking sheets and spread the batter very thin. Using the edge of the spatula, score the batter by drawing lines about 2 inches apart lengthwise and widthwise. Sprinkle with salt. Bake in oven for 20-25 minutes, until the crackers begin to harden, but not blacken (you have to watch these carefully to make sure they don’t burn). Turn the oven off, but leave the crackers in the oven for another hour. As the oven cools, the crackers will harden. I like my crackers with little slices of cheese, spread with sunflower seed butter, or dipped in chocolate raisin date-spread. What do you like to serve your crackers with? *OAS Information: If you have Oral Allergy Syndrome and have a problem with any of the above ingredients, note that the baking process *should* destroy the allergen protein and make most of these veggies safe to eat. For some, celery and even lentils can still be reactive even after cooking. When in doubt, eliminate any of the ingredients you think you might have a problem with. The lentils aren't necessary in this recipe. Can white rice flour be used? For your two sprouted lentil bread recipes what type of lentils (except red) do/can you use? Hi there, yes, you can use 1/2 c white rice flour instead of 1/2 c millet flour, but I would keep the ground flax because that helps bind the crackers. As for the sprouted lentil breads - I haven't tried using any lentils other than the ones I cite in the recipes so I can't really say how a sub would work. I imagine the sprouting time would vary based on the type of lentil and you'd have to adjust the amount of other flours used depending on how paste-like the lentils are. As for my recipes, one of the breads (the Sprouted Red Lentil Bread) uses red lentils specifically and the other (Sprouted Lentil Bread) calls for plain brown lentils, the type most commonly available in stores. Does that clarify things?